The theme for this challenge – “Progress” – had me stymied for quite some time. In addition to trying to figure out how to interpret it, life was full of activity these past two months, some of which involved learning new skills. As I thought about my circumstances, I realized that I was on a learning curve – and that each step of the way, one way or another, I was making progress! This illustration is what often comes to mind when thinking about the concept of a ‘learning curve’ – a smooth, upward-moving curved line. When I saw the two illustrations, the idea for my piece became clear. I created it in grey and white. The white section – below the smooth, upward-moving curve – symbolizes a learning ideal. Highlighting this line in blue emphasizes the apparently peaceful progress of this ideal. 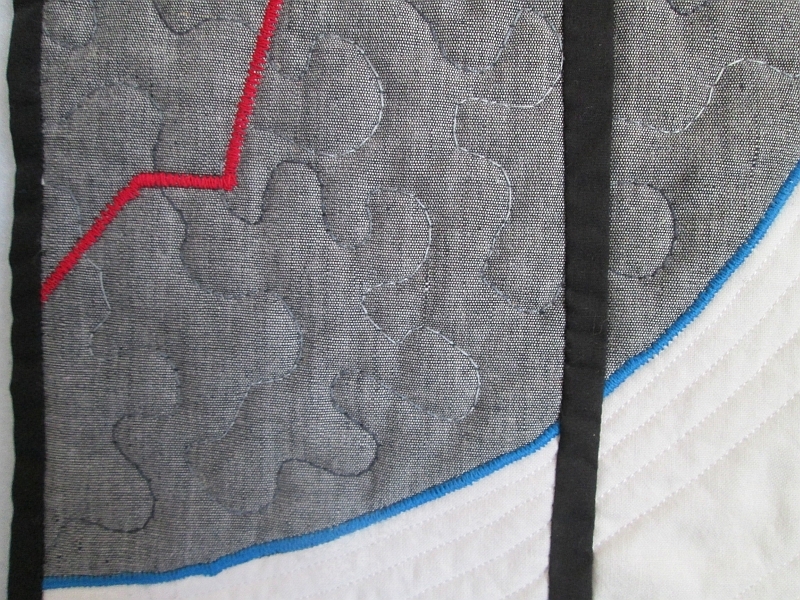 Smoothly-curved echo quilting adds further emphasis to this idea. The grey section symbolizes the activity of our brains – our grey matter – while learning. Closer to reality than the ideal, it is highlighted by a jagged upward-moving red ‘curve’. 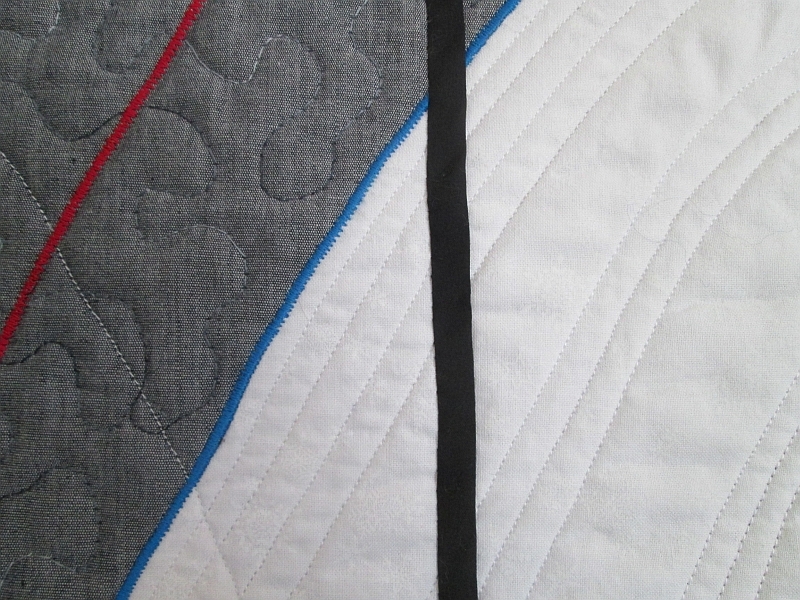 The meandering quilting is designed to illustrate the surface of the brain and also the more random activity of thoughts and ideas as we make progress on a real-life learning curve. The whole is divided in three by stark black lines and bound in black to resemble a scientific graph. Materials: commercial cotton fabric, cotton-polyester blend fabric, cotton and polyester threads. 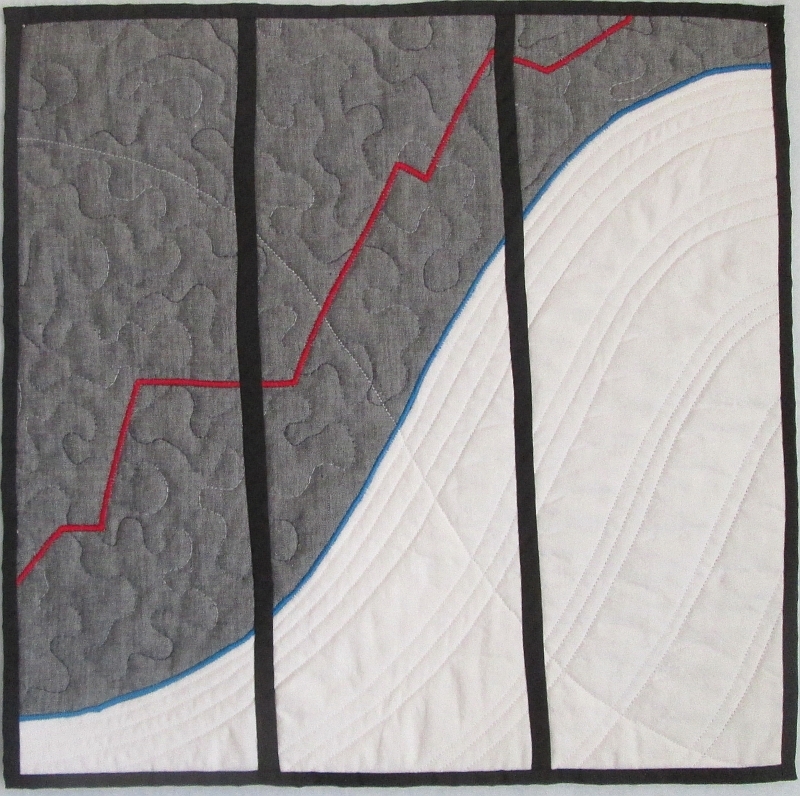 Techniques: curved piecing, applique, machine satin stitching, machine quilting. I love your interpretation of the theme. Well researched!